Orlando Diaz-Azcuy’s prolific career spans 50 years. With degrees in architecture, landscape architecture and planning, he worked with luminaries like Lawrence Halprin and Arthur Gensler before opening his own studio in 1987. Today he is best-known for interior architecture and furniture design. The hallmarks of Diaz-Azcuy’s work—intelligent pragmatism, quiet elegance—have remained consistent. His now-iconic work for Steelcase, McGuire, and HBF reinvigorated those storied brands. 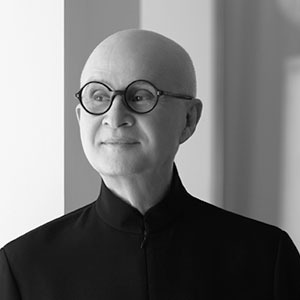 He has received some of the design world’s highest honors, rarely bestowed upon a single person: Interiors Magazine’s Designer of the Year, Interior Design’s Hall of Fame, California Icon of Design, and two honorary doctorates. Orlando Diaz-Azcuy designed the Guava Armchair, the Quadratl Collection, the Savannah Collection and the Orlando Bench, part of The Masters Aluminum Series, exclusively for JANUS et Cie.